This week it’s Everly Grey Maternity. USE CODE EVG20 to get a 20% discount off your Everly Grey purchase for the month of November as a special promotion for my readers. 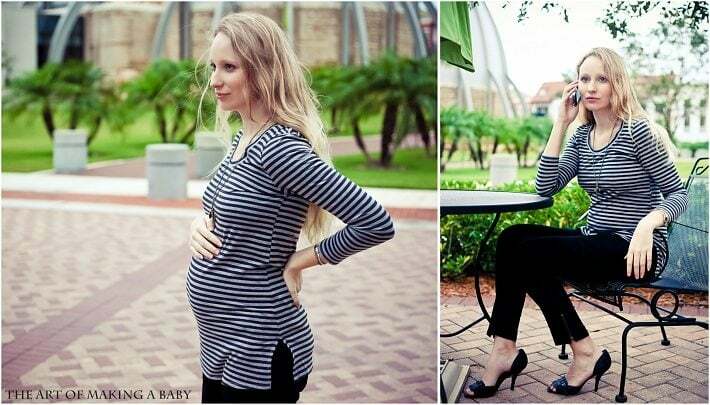 Everly Grey is your total everyday affordable maternity wear, from dresses, to soft tops, to blouses to comfy pants and shorts. I got to try out an Emmy top and Owen twill cargo pants and I have one word for you: COMFORT! I remember when I first received my package and put the Emmy top on, I spent the rest of the day lounging in it. The top feels more like a tunic – long, lean and comfortable, perfect for fall weather. The navy inspired stripes add a touch of elegance to any casual outfit, so you can still look classy if you pair it up with skinny jeans and a pair of stilettos. The 4″ side slits will accommodate your ever-growing front and rear without accentuating it. All together I thought the Emmy Top was a perfect item to have in your wardrobe, both during pregnancy and after. I’d say the biggest complaint I’ve heard from pregnant women about maternity clothes are pants/jeans that just don’t fit/don’t fit right. And I have to agree: the band pressing on your stomach is just too tight and too uncomfortable after a certain point in pregnancy. Say hello to the Owen Pants! I love twill pants in general. 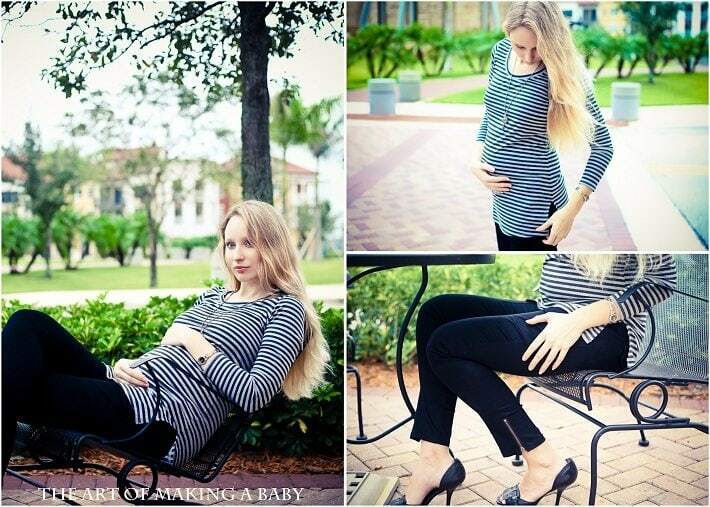 I had a ton of skinny twill pants before pregnancy and hope to buy many more after. I love how they hug your body but don’t look exactly like good old jeans. The band of these pants is below the belly, just like you’d wear normal pants, except for it’s a slightly thicker and sort of like a soft scrunchy. It doesn’t press on your tummy but doesn’t stick out from under your shirt. In other words, the pants band fits perfectly under your belly without causing any discomfort or bunching up. I love the zipper on the ankle that gives it a more rough look, as well as big pockets on the back and the sides that take the pants from leggings category to cargo pants field. All the Everly Grey items I have are extremely soft and comfortable, but most importantly affordable. And now you get an opportunity to win your own Emmy Top or Owen Cargo Pants in your size! All you have to do is ENTER the giveaway below. Please read the rules carefully, but otherwise it’s super easy with Rafflecopter (no more multiple comments for entries- one click each and you’re done (almost)). You can also USE CODE EVG20 to get a 20% discount off your Everly Grey purchase for the month of November as a special promotion for my readers. They are having a really good sale right now, so don’t miss out. Please make sure to comment on which Everly Grey item you like to be eligible (entry #2). The comment is to be posted to this blog post. The giveaway is open to US residents only. All comments will be moderated and will appear once approved. Disclosure: I received these item from Everly Grey for review. All opinions are 100% my own. I want the Lilly dress! So cute! I love the Beth dress! I love the cargo pants! I would get the emmy top! I like the Emmy top! I like the Delia top. I would love the emmy top! I really like the Emmy top as well and the OWen zip cargo pants. Would love to win the top…also love the Posen Embroidered Dress!!! I love the “Everly Grey Sweater” and I would love to win the Owen pants! I agree with the comment: pants are difficult and uncomfortable. Its hard enough feeling “bigger” than your used to be, you dont want to look frumpy and large too. I tried sqeezing into the old jeans for a while and agree, they just start to hurt. I think those cargo pants look great and would be worthing giving a try. I am in love with the Marissa top! I love the cargo pants!!! Love! Look the Skylar Top. Looks so comfy!